Are you looking for healthy gluten free pasta alternatives? So many people say, “I could never live without my pasta!! !” … maybe it’s because you don’t know about all the many amazing alternatives. Here are 10 of our favourite healthy gluten and wheat free pasta alternatives for you to try. Spaghetti squash gets its name from the (cooked) inner flesh of a spaghetti squash which looks very similar to strands of noodles when scraped through with a fork. If you want to learn more about this unusual vegetable I recommend reading theses blogs, ‘How to Perfectly Bake Spaghetti Squash’ and ‘When to Harvest Spaghetti Squash and ‘When to Pick Spaghetti Squash‘. Though it’s not shaped like pasta, this ancient grain can be a great pasta alternative and is a fantastic source of protein. 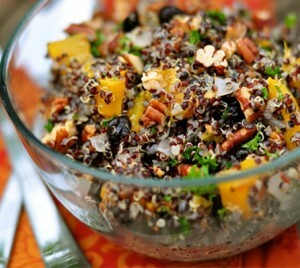 You can add it to salads, soups, stews, curries or simply have as a side. We recommend soaking the quinoa overnight in filtered water with a good pinch of Changing Habits Seaweed Salt, then rinsing the quinoa in fresh water in the morning and cooking as per usual. This will help to de-activate the anti-nutrients that are present, which will result in your body absorbing and utilising the minerals more effectively. Rice noodles are a quick, easy and a wonderful addition to dishes like laksa, curries, pad thai, stir frys and other oriental inspired dishes. They’re available at any health food store, supermarket or Asian grocery store. Shirataki is made from a root vegetable found in Asia and is often called ‘miracle noodles’ because they contain no carbohydrates and are rich in fibre. You can find these in health food stores and in some supermarkets too. Kelp noodles are made from seaweed and are rich in iodine and fibre. You can eat kelp noodles when they’re crunchy by rinsing them in filtered water before adding them to salads and other dishes. If you prefer to eat them softer, you can soak them in a bowl of hot water with a teaspoon of apple cider vinegar and a pinch of Changing Habits Seaweed Salt for 30 minutes. Simply rinse the noodles and add them your meal eg a stir fry, or bolognaise sauce and cook the noodles until they soften. You can find these in your local health food store or online from companies such as iHerb. Cabbage is such a versatile, forgotten vegetable. Shredded cabbage can be a great pasta alternative as it makes a great ‘bed/ base’ for beautiful sauce such as bolognaise sauce. Many vegetables like zucchini are great to use as a base for your pasta sauces. You can use them in a number of different ways – shredded, julienned, cut into ribbons using a peeler or a spiralizer. By using zucchinis for pasta you will increase the vegetable content of your dishes. Just like zucchini noodles (zoodles) you can also ‘spiralise’ cucumbers, carrots, beetroots, sweet potatos, parsnips and other similar root vegetables. 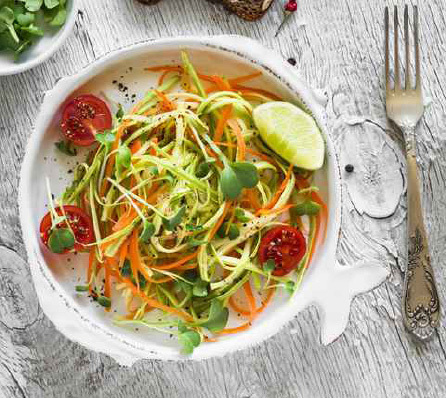 If you don’t have a spiraliser you could simply use a peeler and create vegetable ribbons. 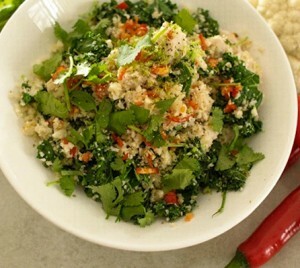 Another fantastic alternative to pasta, cous cous and semolina is cauliflower ‘faux rice’. It’s so simple to make and you don’t need any fancy kitchen tools either. You can simply grate the cauliflower into what resembles rice or chop it up finely. Simply fry it in a little coconut oil or butter with herbs, spices, garlic and onions for a couple of minutes. Rice is incredibly versatile, as it can be used in both sweet and savoury dishes by making sushi and by adding it to salads, soups, stews and curries. We recommend soaking organic white rice overnight in filtered water with a good pinch of Changing Habits Seaweed Salt, before rinsing it in fresh water the next morning. If you have insulin issues or find it easy to overindulge in white rice then you might want to consider adding a little coconut oil to your rice when cooking it. When you cook the rice with coconut oil and allow it to cool overnight in the fridge, it produces a smaller spike in your blood sugar when you eat it because the rice is rich in resistant starch. This improves insulin sensitivity in your body, enhances sleep, energy levels and mental clarity as well as being a great food source for the beneficial bacteria in your gut. You can click on the following links to read more about it – here, here and here. Grains need to be soaked with an acid, even acidulated water is fine. Cook in the water they soaked, dont rinse. Nuts and seeds can be soaked in salted water. Legumes need soaking too, but Ive never had luck using an acid with them. So I just soak 24 hrs in warm water and rinse that water off. I also put spaghetti or stroganoff on salad; yep, it rly isnt bad. I put chicken, turkey, salmon or tuna salad on salad also. No bread needed then. I buy coleslaw mix in the produce section and use that usually, instead of shredding my own cabbage. Like bagged salads and baby carrots, its a tremendous time-saver. These are some great ideas. It has been so hard to give up wheat (this is just Day 4 for me) so I appreciate the tips. I will try the cauliflower tonight. Thanks. I’m still struggling, I’m not enjoying spirulised veg or cauliflower rice at all. Hi Kate, I’m so sorry to hear this. You can also learn about grass fed meats, which are exceptionally healthy. Don’t listen to the corporate farmers and their promotions of grain fed beef. There are many sources, but I suggest texasgrassfedbeef.com eatwild.com and many other paleo type diets. Once off the grains, it’s amazing how health improves, sleep improves, and in a moment of weakness, when you try a slice of bread, and it makes you sick to your stomach, you will then understand the damaging effects of wheat and grains. Still, each person has discover for themselves. I wish you a pleasant journey toward better health. It’s so hard , I’m excited though I haven’t had much relief I do juice everyday with ginger good for my arthritis looking forward to incorporating this new way of living in my life. There are some other options – Buckwheat flour. You can make pancakes with a mixture of rice flour and amaranth flour or ragi flour. Go to the millets family and it opens anothre world for you. You can also use jowar flour or pearl millet flour (bajra) to make some flatbreads and then top them with pizza sauce. Tolerant Organic Red & Green Lentil Penne has only one ingredient — LENTILS! I think you can feed some and they won’t even know it’s not real pasta. Pretty good, and I am a pasta lover. Even my hubby (who’s taste buds are like those of a child) actually ate it. My tummy would always bloat fairly quickly after eating wheat products. I swapped to organic Spelt and even bake my own bread, result never a problem. Except it is expensive of course but Hubby loves it. Spelt is great, sweeter than wheat, but it is a form of wheat and does contain gluten. Yes that’s right, spelt does contain gluten.